You should select bridesmaid dresses that are not only complementary to your wedding dress and overall wedding theme, but you also need to consider whether your choice of dress is also affordable for your bridesmaids, who often don't have the same budget as you do for your dress. If your bridesmaids cannot afford a fancy dress, you should pay for them yourself rather than force them to forfeit their role in your wedding. More than one wedding has been ruined because of hurt feelings, and it's easy to overcome them if you show a little sensitivity to your bridesmaids' needs. Pardon the pun in that subhead, but sometimes your bridesmaids have figure problems that you don't. In those cases, you should try to ensure that they look their best in the bridesmaid dresses you choose for your bridal attendants. Slightly overweight bridesmaids will feel uncomfortable in tight bridesmaid dresses that don't complement their figures -- and your tomboyish friends won't want to wear lilac ruffles and frills. As a result, your bridesmaids' shoes should be selected based on their style and comfort level. To make things simpler and ensure that your bridesmaids' tootsies are comfy enough to dance all night at your reception, you can ask them to choose shoes to suit their tastes in an appropriate color if you'd like -- taking the pressure off of you to choose for them in the process. 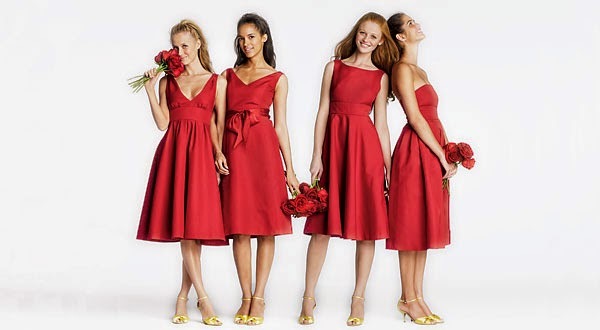 Shopping tip: You can find a wide range of bridesmaid dresses online, but I recommend that all shoe purchases are made in person by the bridesmaids themselves.